← Why is this world so? 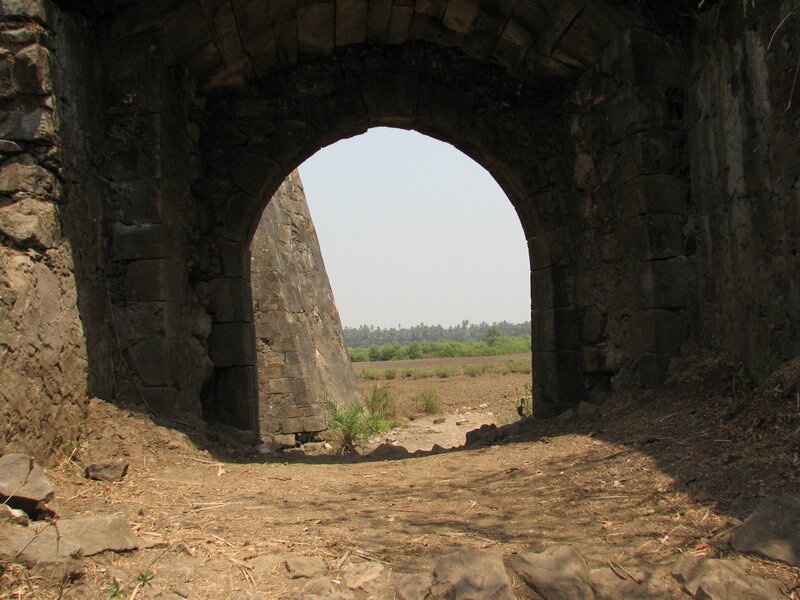 The Aim: To Do Vasai [Bassien] and Arnala Forts in one single trip. 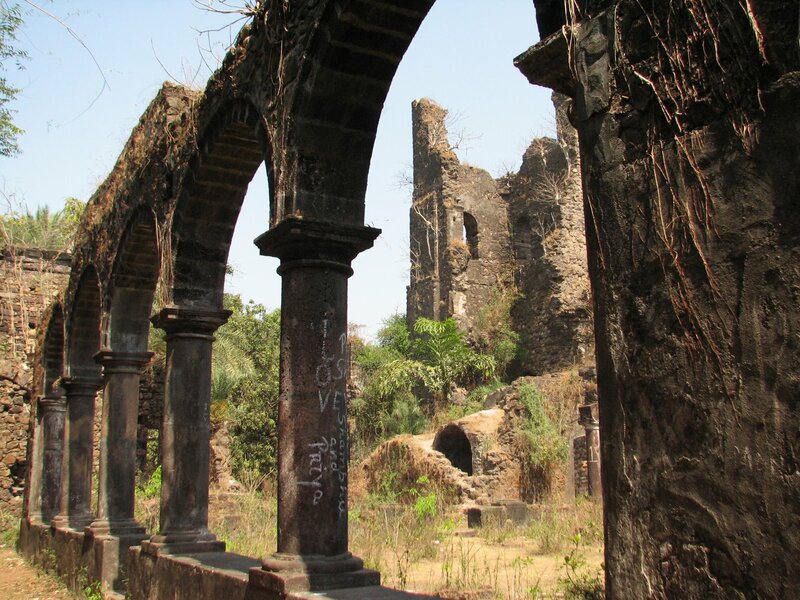 The day finally came when the planned trip to Vasai fort had been finalised. This fort was long overdue. Maybe from last 4-5 years. Finally the party was decided. Finally the party was Mr. Jagdale and me. Sumit descended from Pune the night before and the rendezvous point was first decided at Dadar, but then changed to Bandra. I woke up at 5:15 and woke up Sumit at 5:30 am. The scheduled meet was at 6:30 at Bandra Station. At about 5:50 I left HBC, since I had to get a ticket first, I had to miss two trains, and when I had the ticket, there was no train for next 15 minutes. Anyways reached Bandra at 6:45 via Vadala Road. Sumit wasn’t still there yet. So had to let go three more trains. When the last one was missed I guess we were the only two guys left on the platform. Anyways the next one was at 7:05 Virar fast. So we hopped up on that. When the salt plains of Bhayendar could be seen we went to the gate. Early in the morning the coolness that you feel is really good. I wish the weather in Mumbai was the same throughout the day. 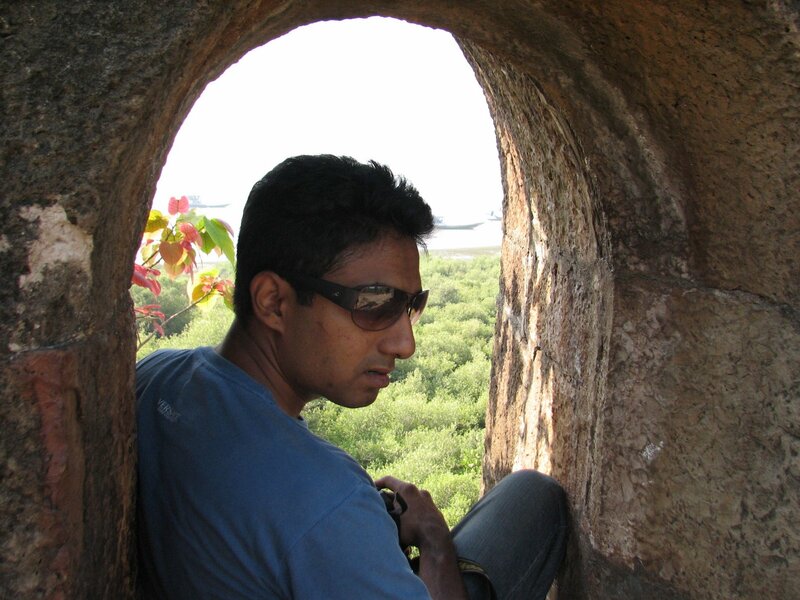 When we crossed the Bassien or Vasai creek a sense of freedom from the city of came. 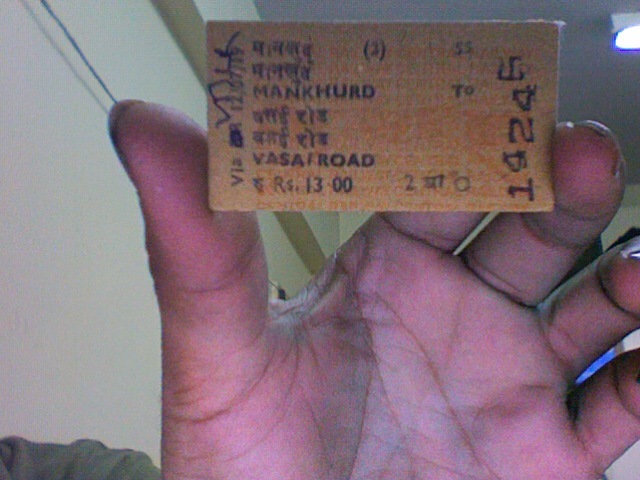 Anyways got down at Vasai Road at about 8:15. Then we checked into an Udipi hotel, had breakfast of the South Indian type. We took an auto to Vasai Fort for Rs. 50 which we realised later was a larger payment than required. 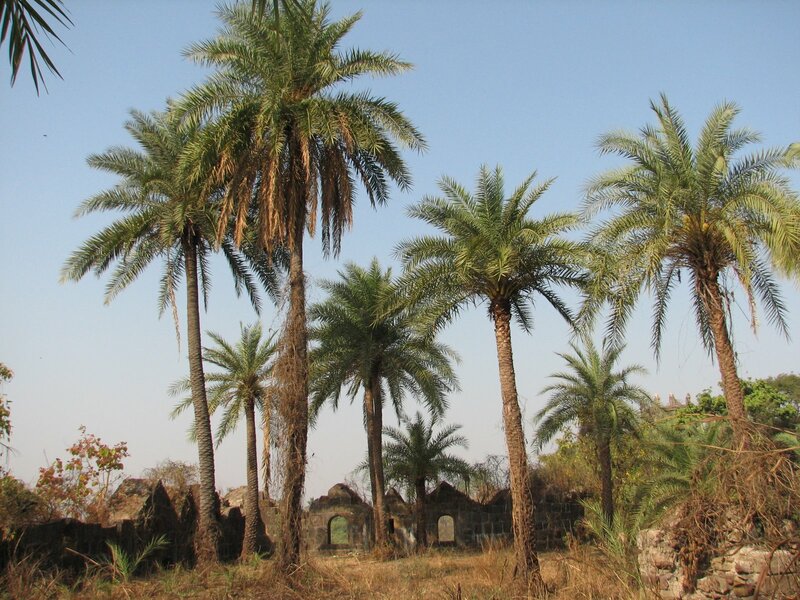 The drive through Vasai village gives you a feel of the country side. Along the road there was a market in which the locally produced [I guess] veggies were being sold. I had a desire to go and buy some, but considering the long day in front of us, decided against it. At the bus depot we took a left turn towards the fort. 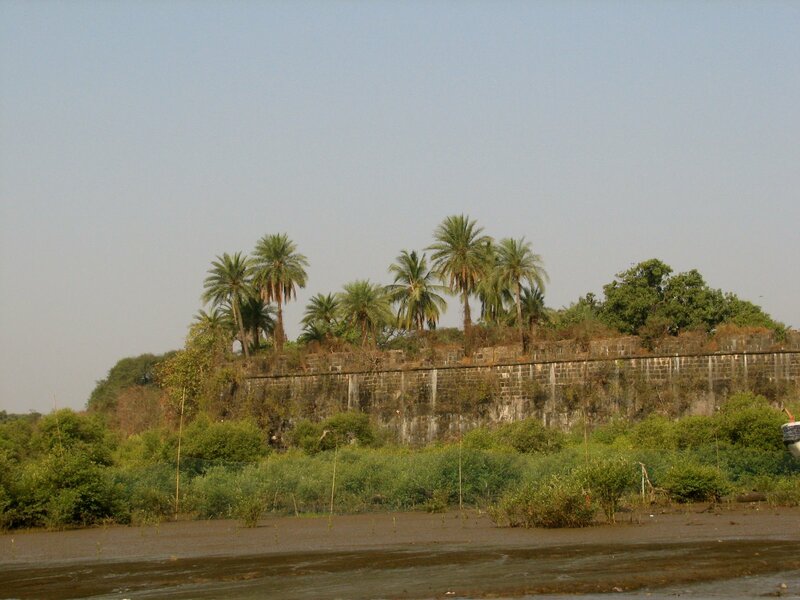 The fort became visible as we passed the Vasai police station. 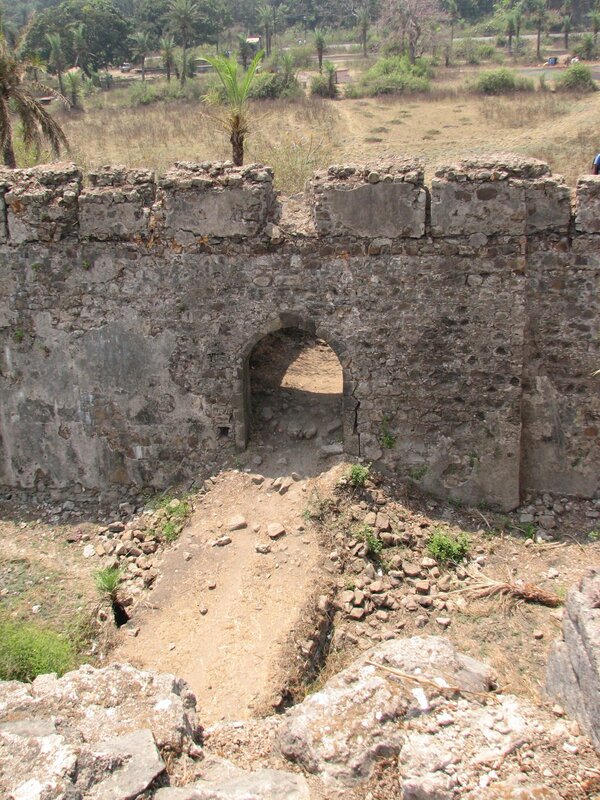 A part of the outer wall has been torn down to make the road, from where we currently enter the fort. 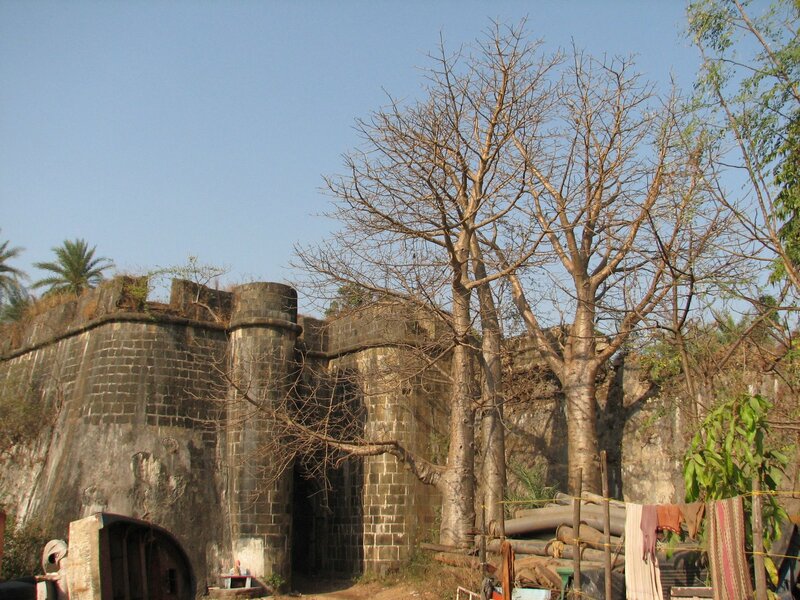 The fort has 10 bastions and is totally European in its architecture. 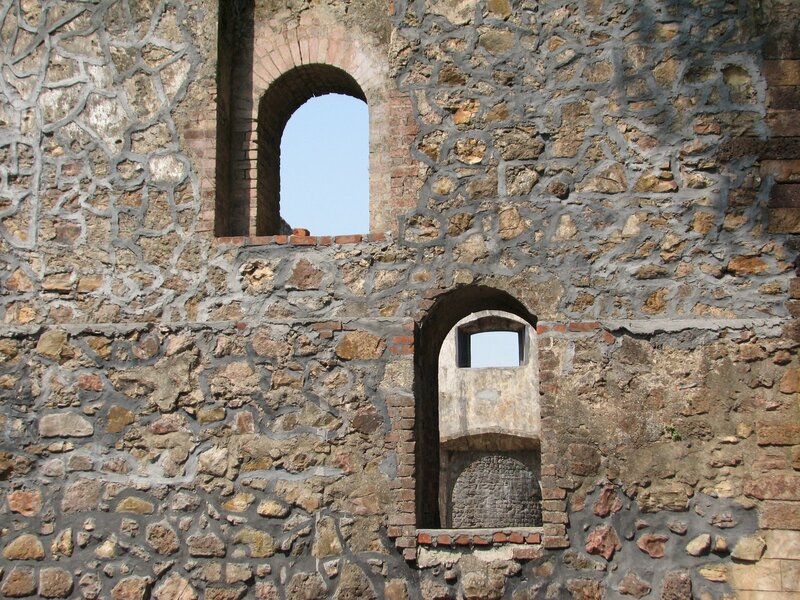 The bastions are shaped like arrowheads, as opposed to rounded ones in India. The fort is strategically located to the North of Bassien creek. To the west there is marsh land. To east at present is the Vasai koliwada, to the south is the sea. To the north is the current city of Vasai . 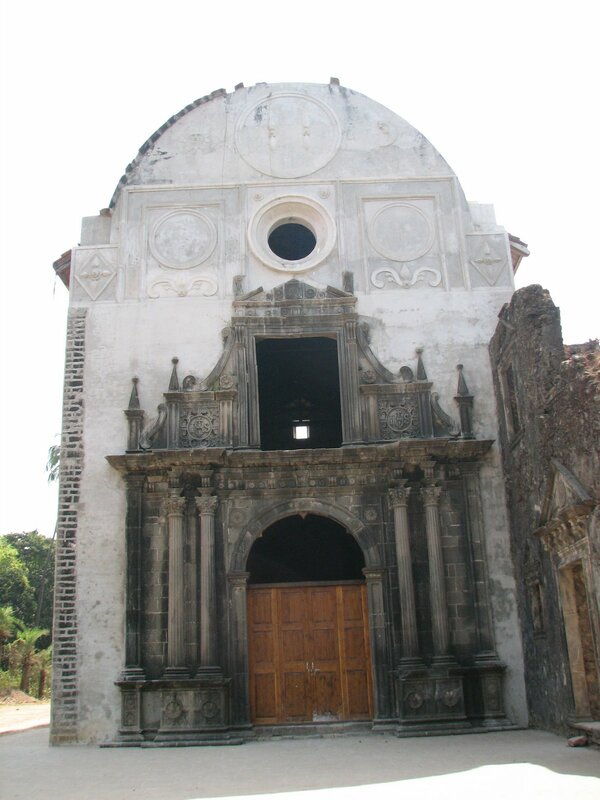 Out of the 10 bastions 9 were supposedly named as Cavallerio, Nossa Senhora dos Remedios, Reis Magos Santiago, Sam Gonçalo, Madre de Deos, and Sam Sebastião, Sam Sebastião. 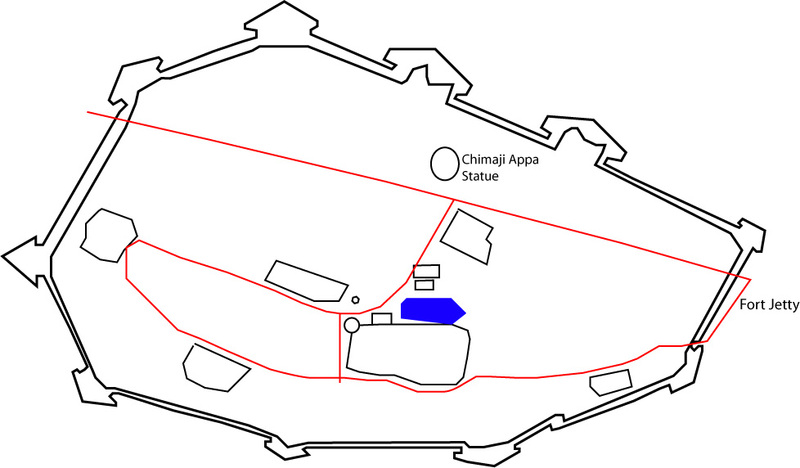 Below is a sketch map of the Vasai fort, drawn from the Wikimapia images. Compare this with the old Portuguese maps, which I found here. 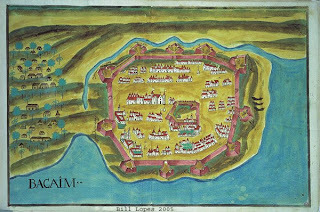 A brief history of fort is available at Wikipedia entry on the same. 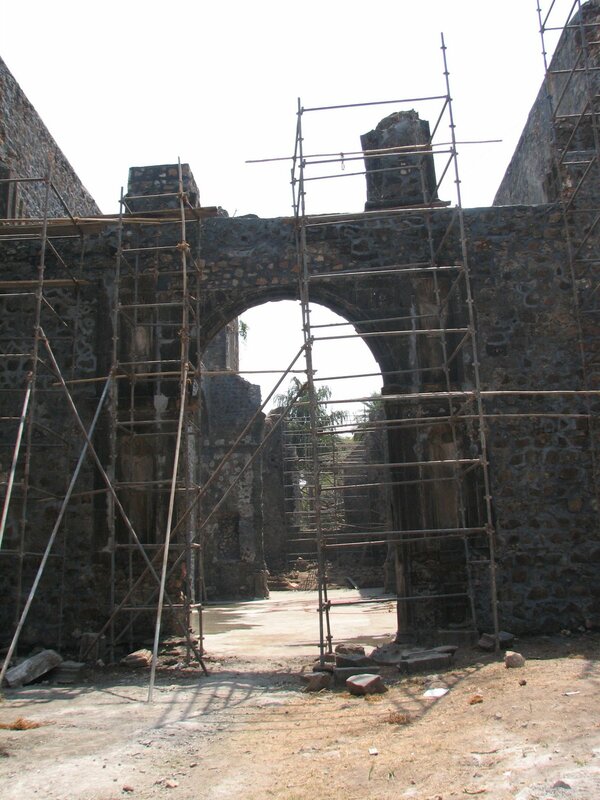 Also I found this site very informative with some original images of the fort. 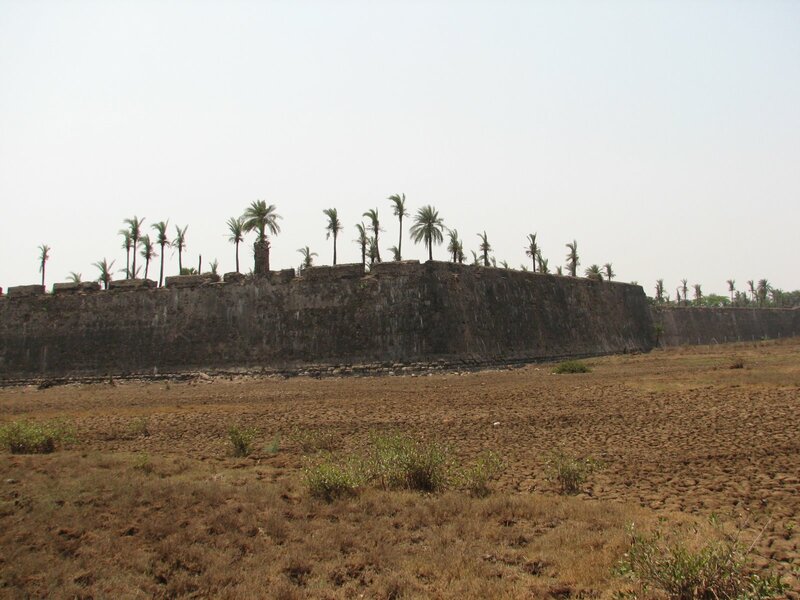 The Fort was won by Marathas under Chimaji Appa in 1739, with much casualties, before that it was the Portuguese capital of North Konkan. 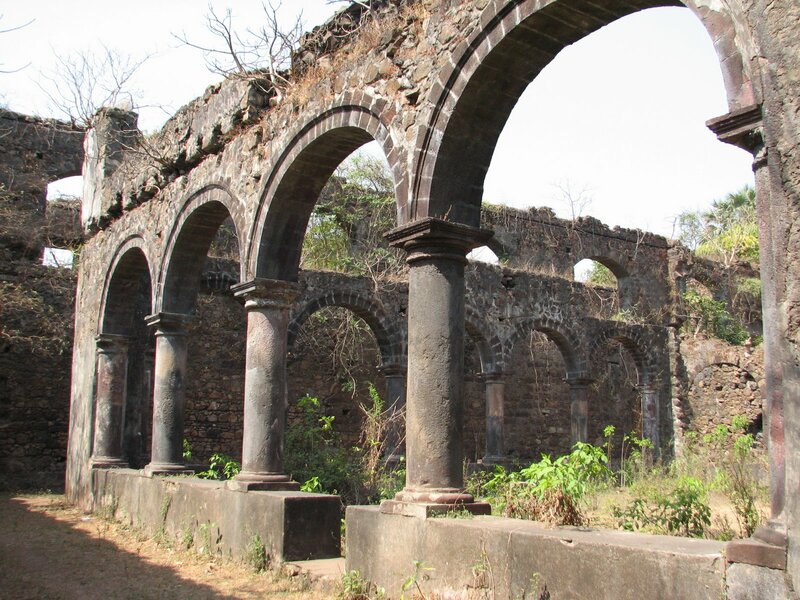 When in its full glory the Vasai fort must have been wonderful. 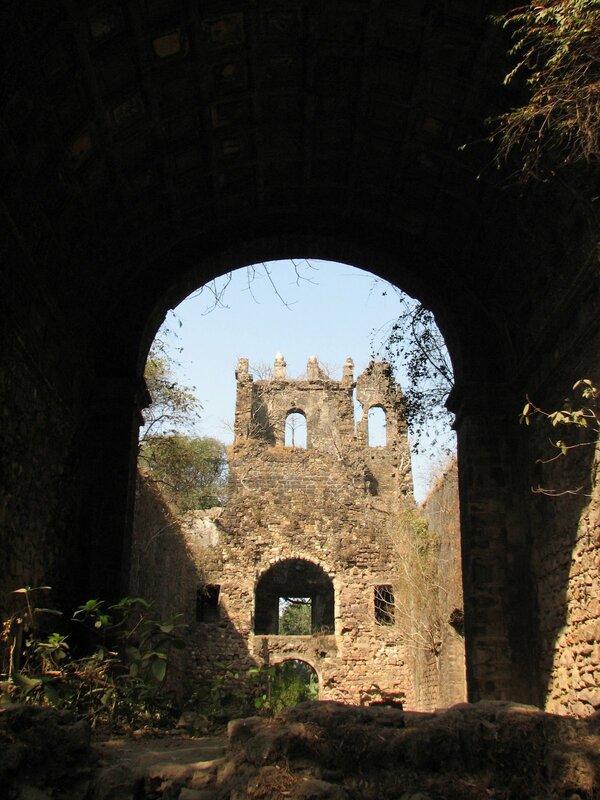 Even the ruins of the fort are magnificent. You get a feeling of being transformed into their era when you are in them. 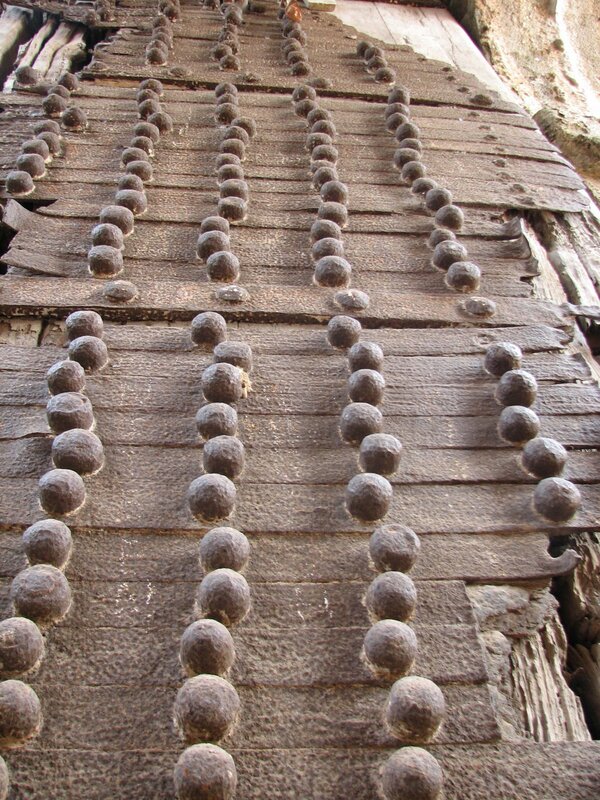 One interesting thing to note is that there still is a full wooden door, with all its ornamentation. I doubt it is the original one but it was a pleasant surprise nonetheless. 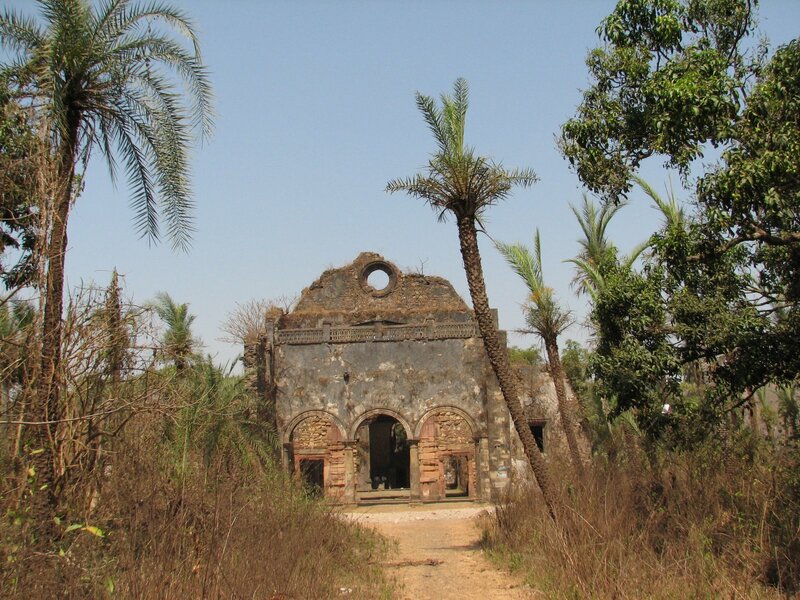 As you enter the fort from this side there is a small temple on the left hand side, which was established by Chimaji Appa, when the fort was won. 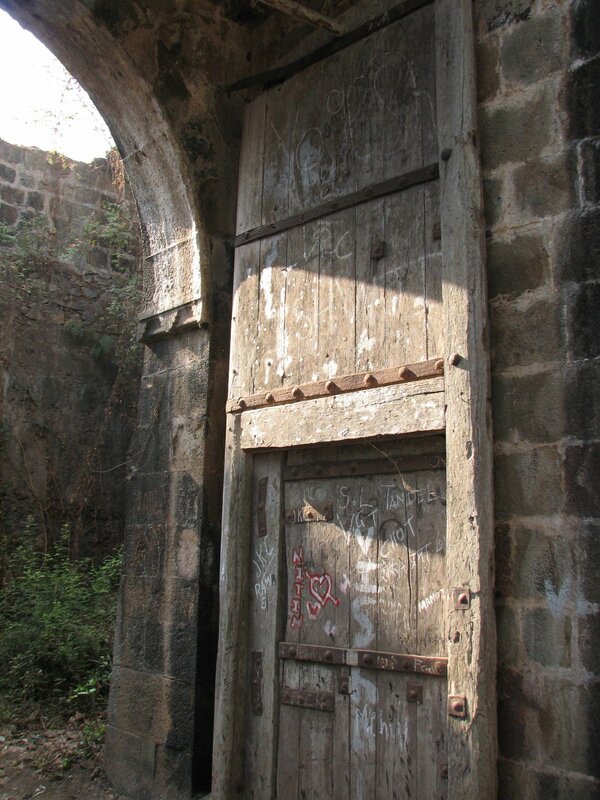 The inner gate also has its wooden door intact. 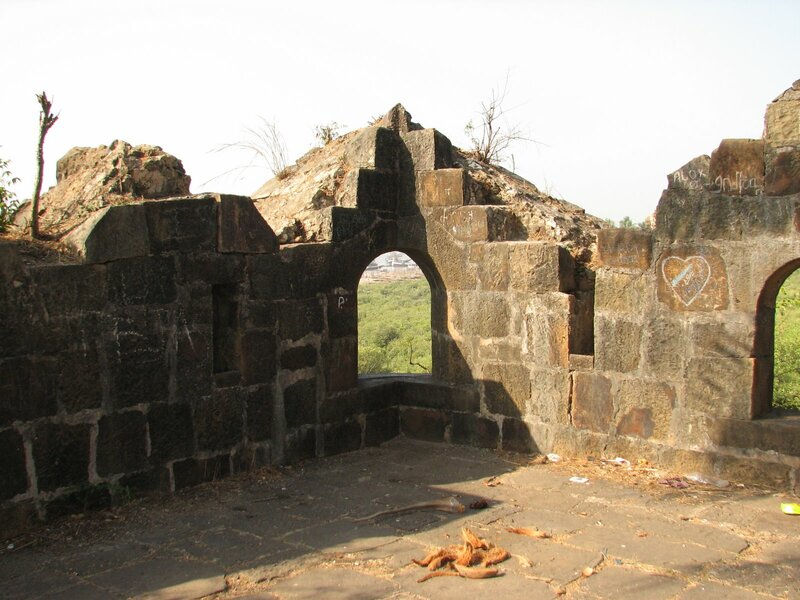 We went up the stairs that are behind the small temple, which is one of the ten bastions of the fort [Though at that time we did not know that is was a bastion]. There were trees growing on the bastion floor! 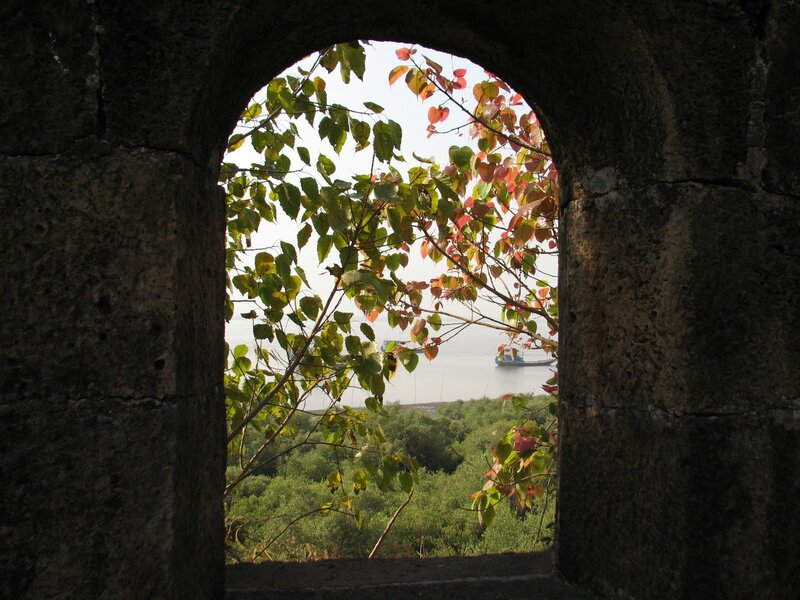 The windows of the bastion overlook the Bassien creek and give a nice view of the mangroves below and the fishing ships beyond. Sumit in one of the windows. On the bastion a vine with yellow flowers was in full bloom. Ritesh the best taxonomer I know was not able to identify it [Id anybody?]. 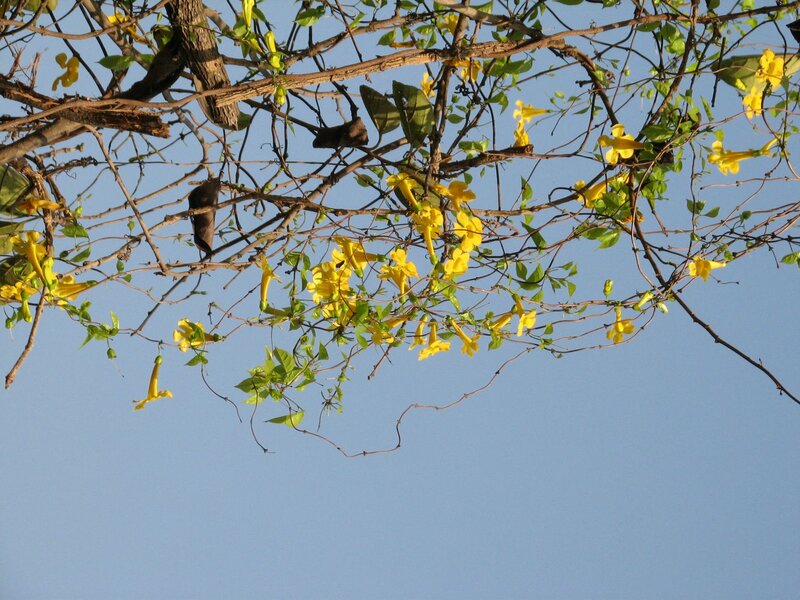 The plant was identified by Samir as Yellow Trumpet Creeper Macfadyena unguis-cati, also called Cat’s Claw. See the comment. Then we went on to a cathedral. Deja-vu!! Simply because this location has been used in a lot of movies and also videos. 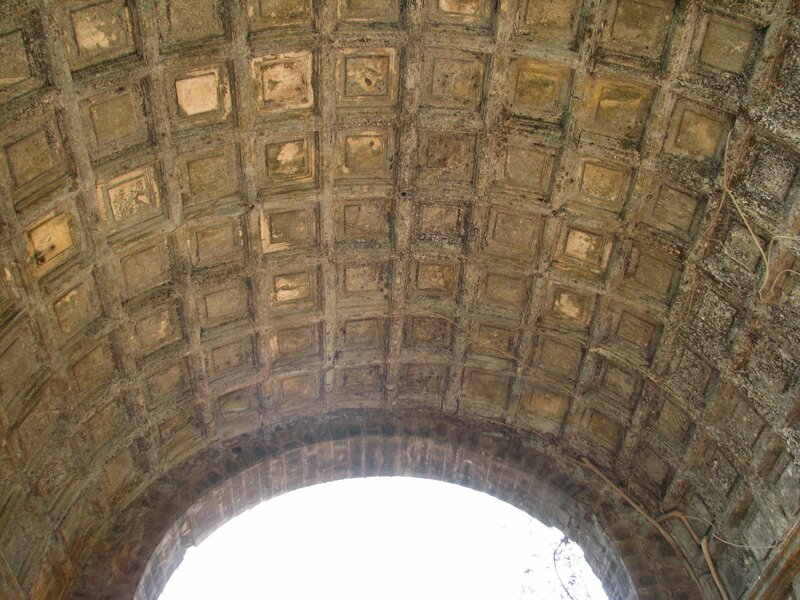 Anyways the ceiling of one part of the cathedral is still intact. Though it has lost its lustre it must have been really magnificent. This was our first major halt in the fort. 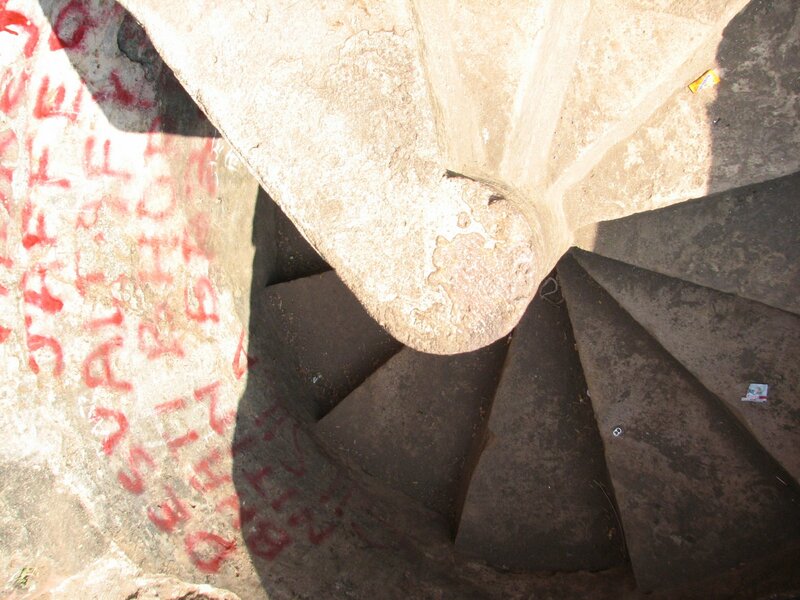 The cathedral also has spiral staircase, which is very unique in construction. 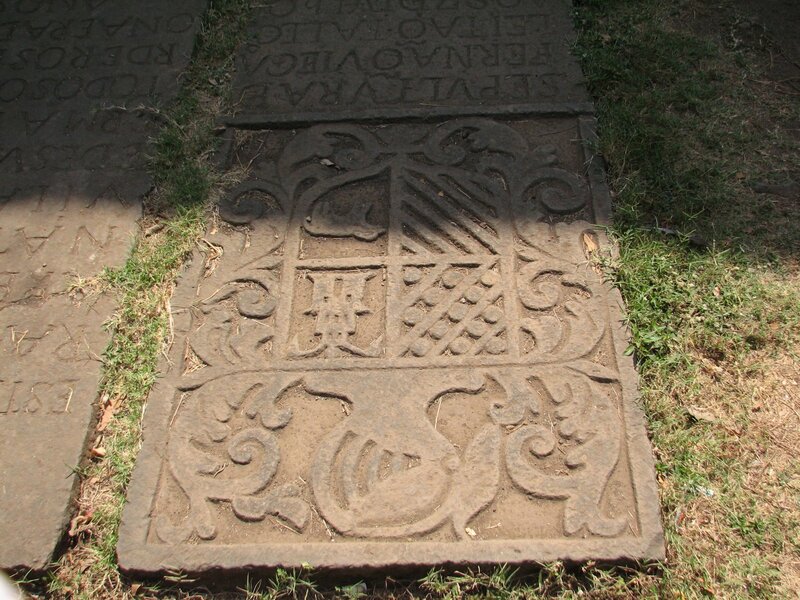 The steps and the axis are carved out in a single stone. See the picture and you will probably understand. Here again the bane of Indian archaeological sites viz. graffiti is abound. Some people are trying to make themselves known to the world at the cost of damaging and ruining our cultural heritage. Yuck!! I don’t know with what mentality people do this, are they trying to claim the place for themselves? Shame on them. The tower below I guess is the highest point in what remains in the fort. There were parakeets on the overgrown trees on the top. Mr. Jagdale was full of adrenaline and he went along the walls to the otherside of the tower structure where this wonderful ceiling is present. He told that the ceiling part has been reinforced with concrete. Here a lot of birds were seen, but could not ID[anyway I am not good at it] or take a shot at them. One bird of prey was in the sky above but did not get a good shot at it. [It is at moments like this I miss the telephoto lens 😦 which I do not have]. 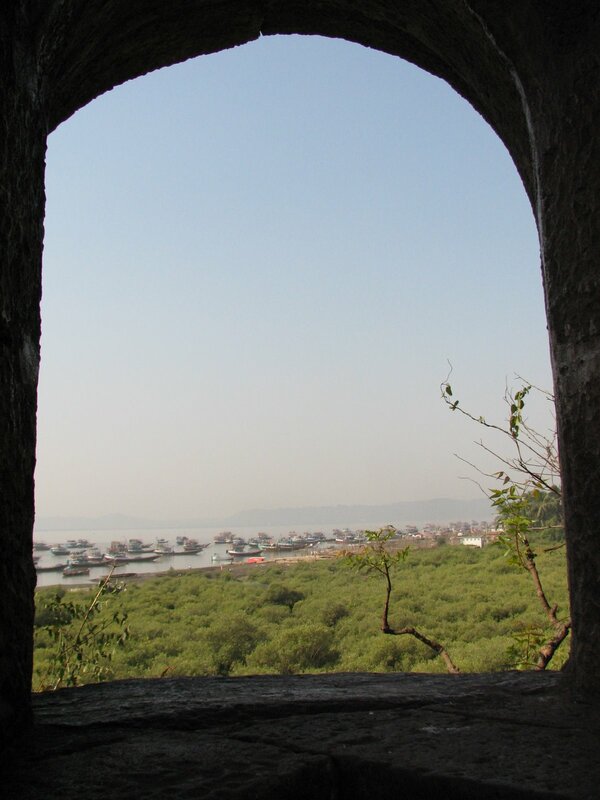 We walked through dense cover of trees through a path, which took us to the citadel of the fort. The most prominent trees are mango [which was in full bloom], tamarind and dates. 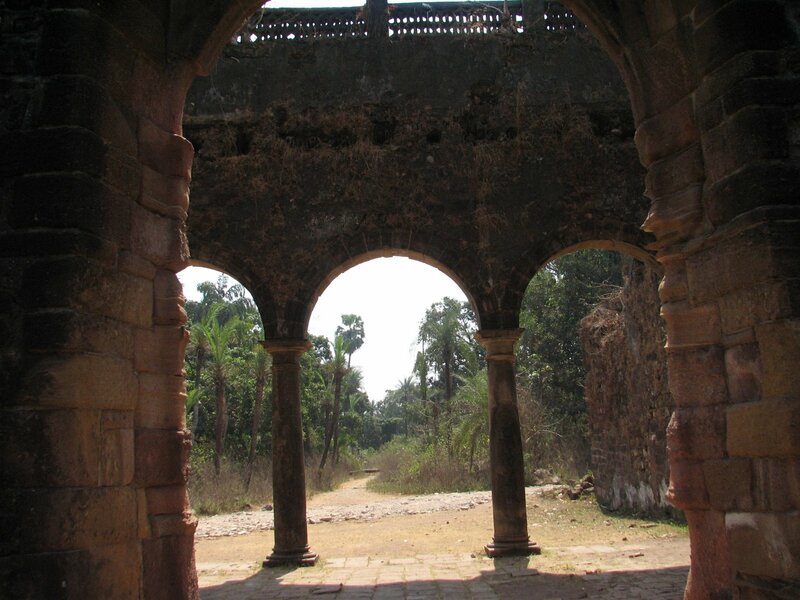 The citadel of the fort has an entrance which is small but very beautiful. There must have been a statue on the door; an empty space is a reminder of that. 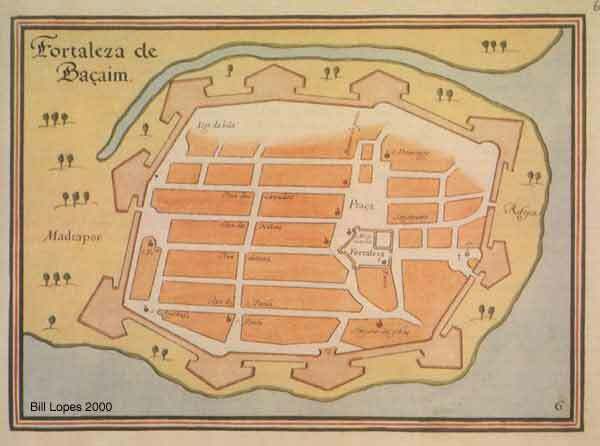 This is the initial fort of St. Sebastian which was extended into the larger fort. 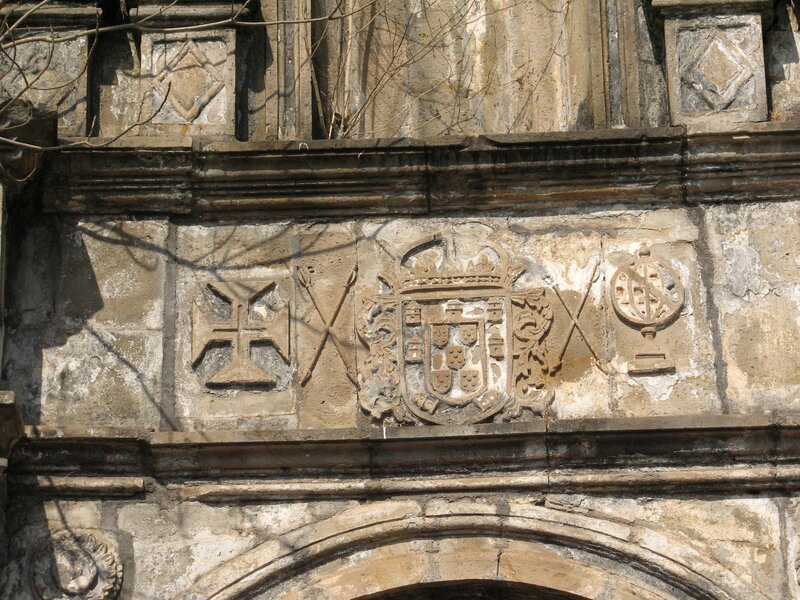 The Portuguese coat-of-arms on the gate. 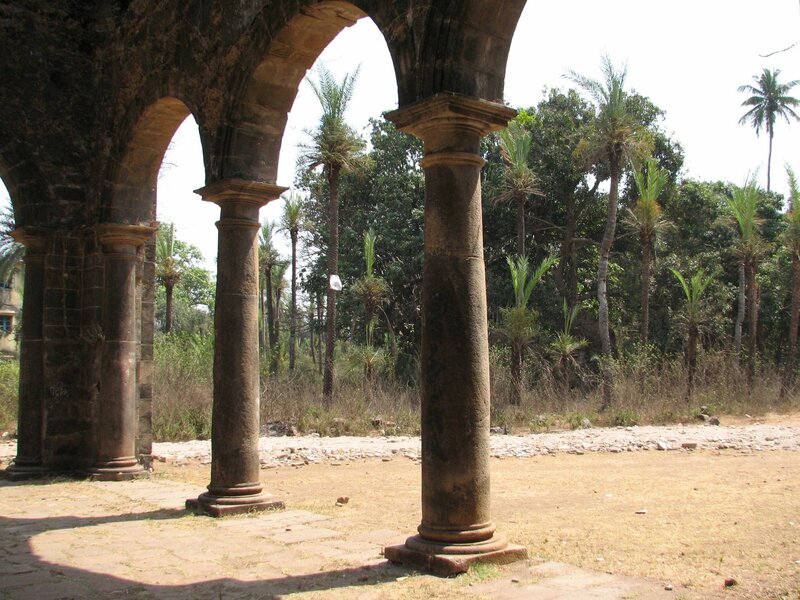 Here you can see two non-pillars; see the photo and you will understand. There were fisher folks in the fort trying to process their webs with some sort of dye. Inside the citadel there is a small pond, which had some herons in it. We went along the wall to the end of it near a bastion. This bastion is circular though. 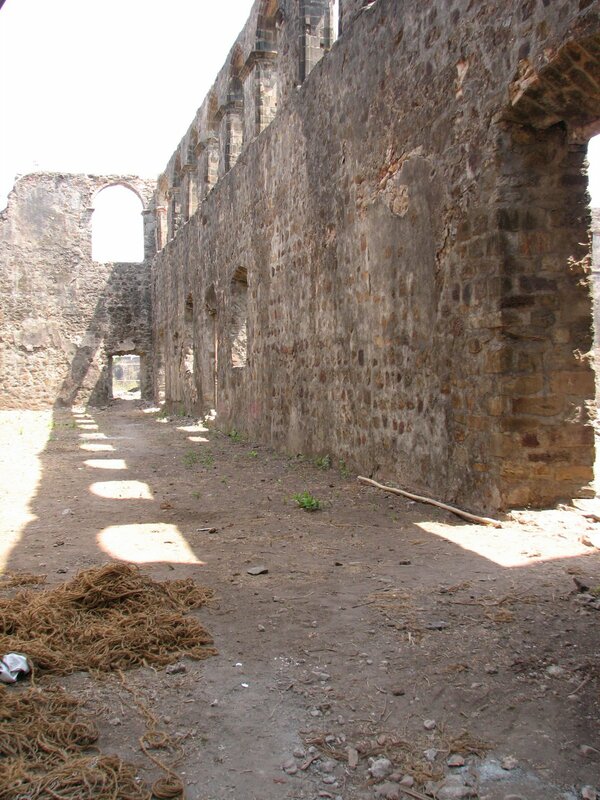 When we went out of the citadel, we came up to the senate house of the fort. Next to the senate house is the lake which is almost at the center of the fort. Along side the lake are two temples, one of Vajreshwari and Nageshwar. From here we took a right turn, where there were more ruins. 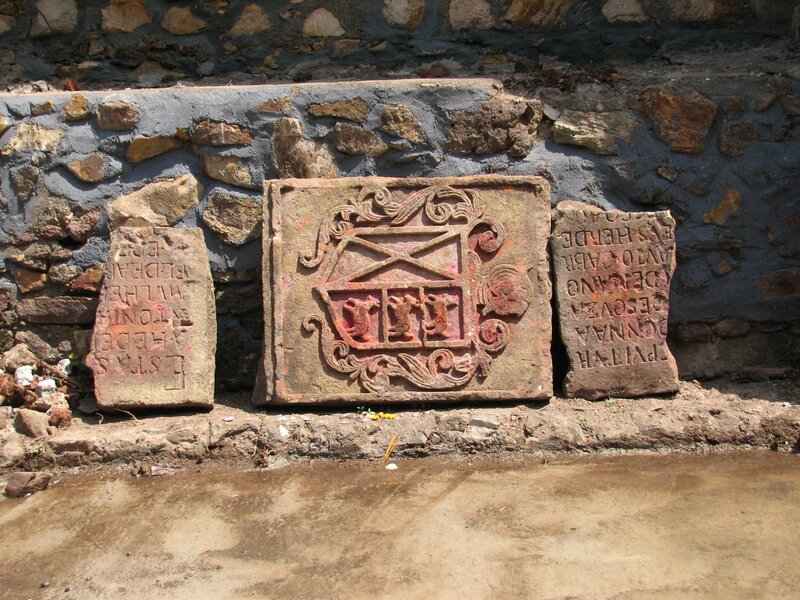 A stone plate with something in roman script [Can anyone translate this?]. From here we went inside towards the unknown, there were people sitting we asked them about more places to visit. 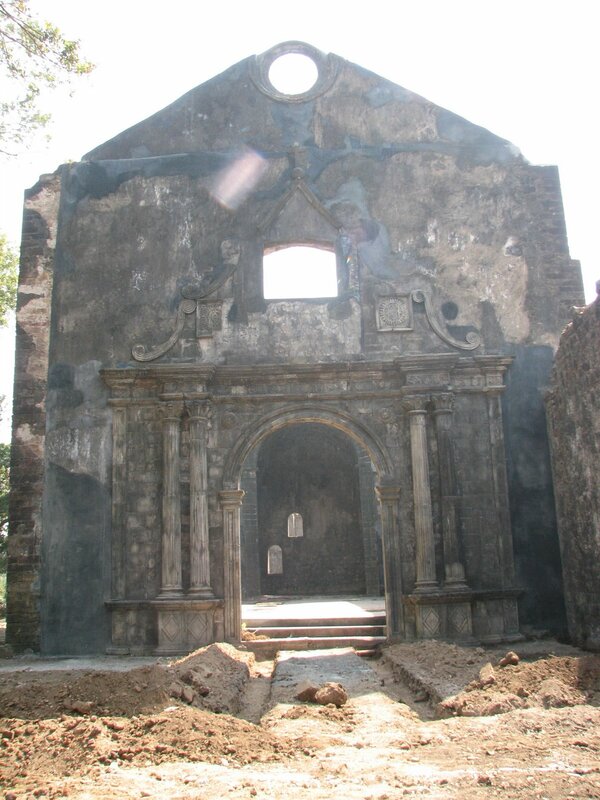 They said that one of the old churches has been restored recently and that we should see it. They were the guardians of the mangoes of the fort. We went by the way told by the guardians and landed up at another place, which Wikimapia says is the Old Convent of St. Anthony. Now this was an awesome place. Arches are numerous as can be seen from the photos below. One of the features of this place is the fact that the floor here has many graves. 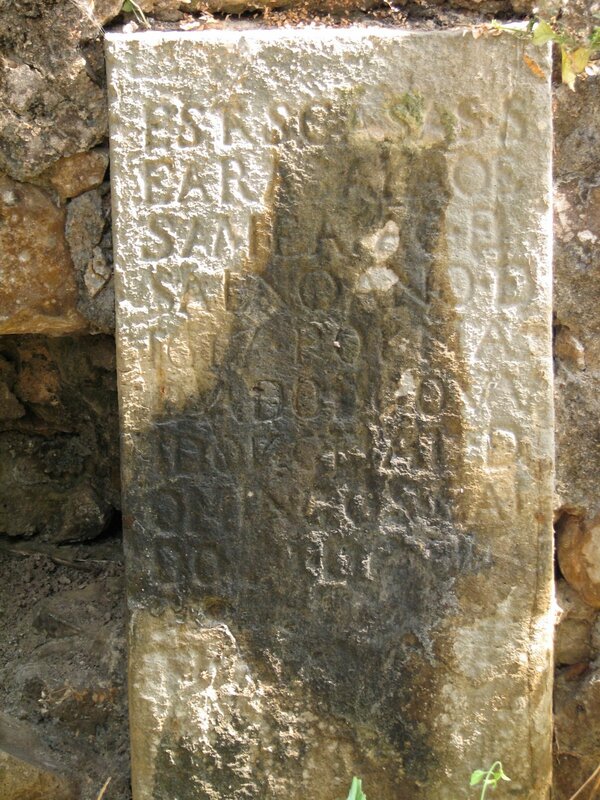 Some of them have coat of arms inscribed on them and some have names and the year of the burial all in roman script. From the inside of the convent. Then after this we went to the restored Augustinian Convent. Most of the restoration is of concrete :(. Some initials which I would like to decipher. 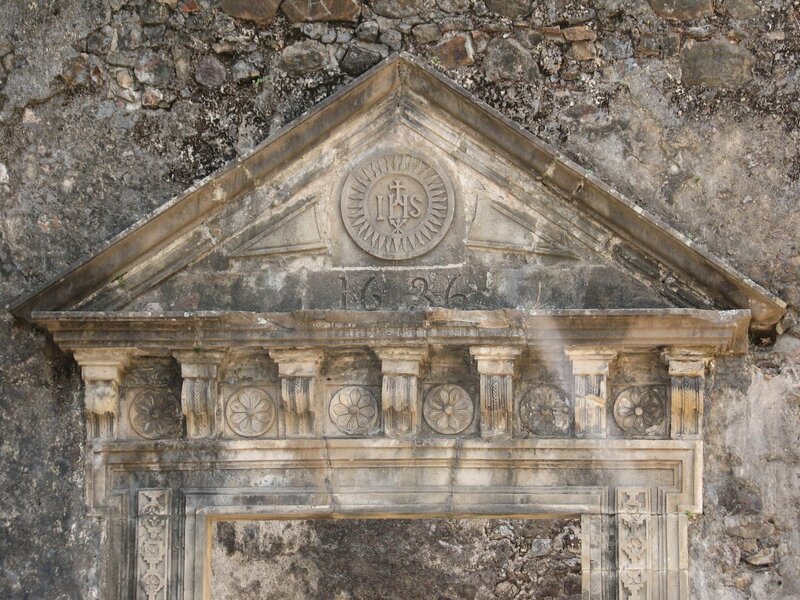 The date inscribed is 1626. 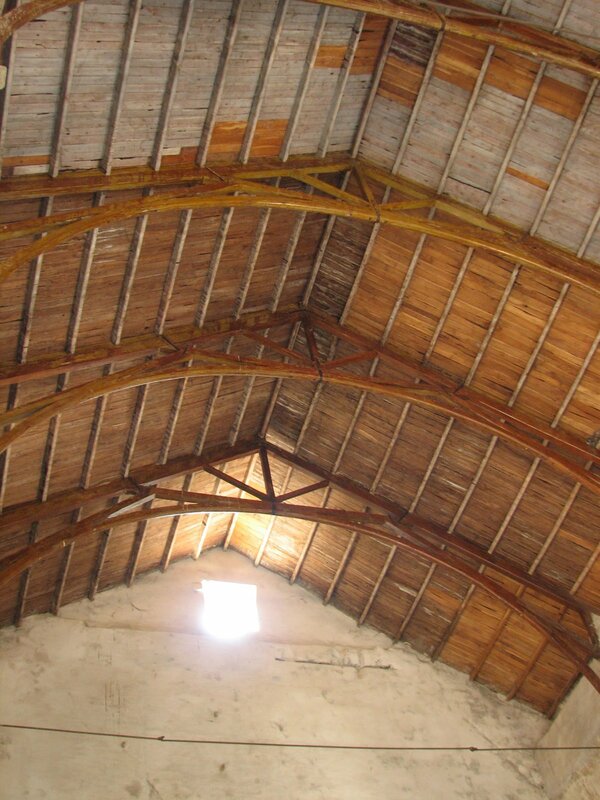 But the ceiling is all wood, and I guess has been done as it actually was. From here on we hit back to the citadel where we came from. 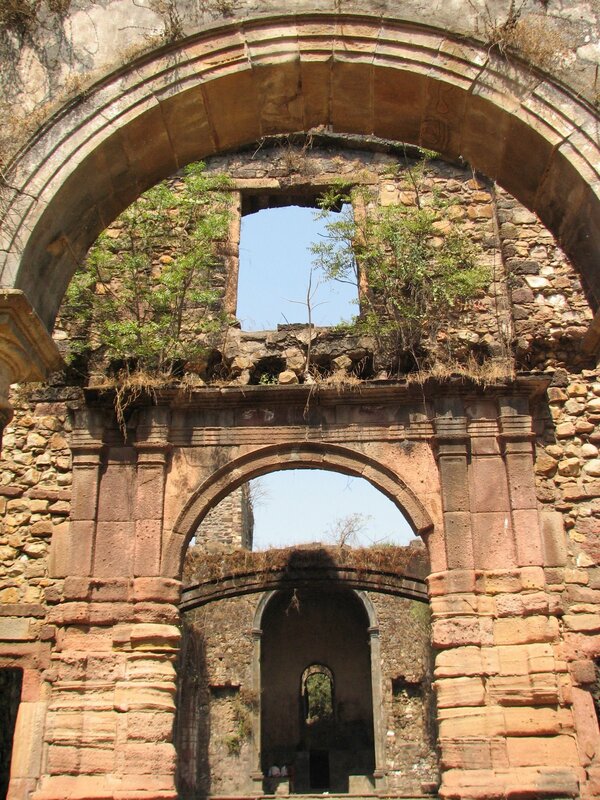 After passing the Nageshwar temple we came to the ruins of the Dominican convent. 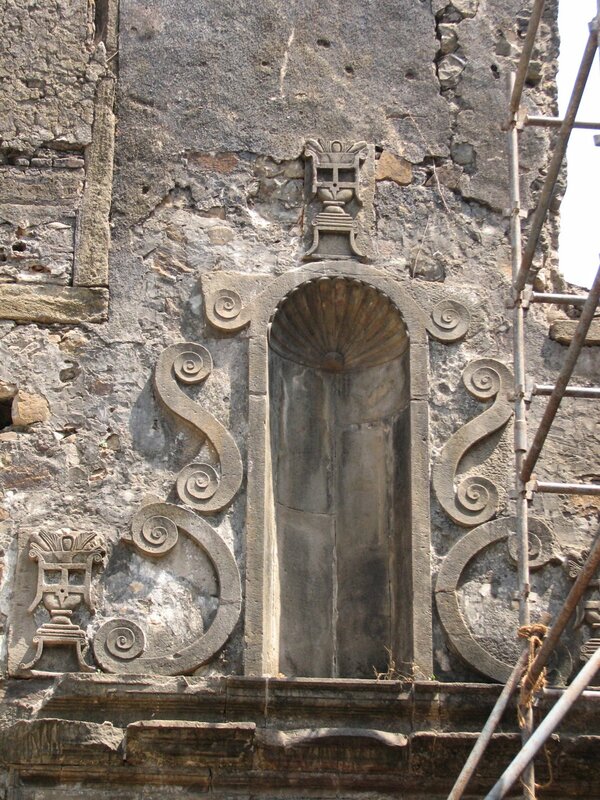 This is another place undergoing restoration. Lots of re-construction going on. This was also a hospital. Is not the statue missing? There was I guess a bell tower also here. From there we get to the main straight road which goes to the fort jetty. And across the road is the statue of the Chimaji Appa who captured the fort in 1739 from the Portuguese. किल््ला हाती येत नाही, तर निदान माझे मस््तक तरी तोफेने उडवुन ते किल््लयात जाऊन पडेल असे करा. Meaning: fort is not yet conquered, then put my head on the canon and at least make sure it lands inside the fort. या मागे युद््धे बहुत प््रापत झाली, परंतु मराठी फौजेस यासारखे युद््ध पडले नाही. सीमासीमाच केली. त््याचा िवस््तार िलहता विस््तार आहे. या जागा फत््ते होणे देवाची दया आहे. 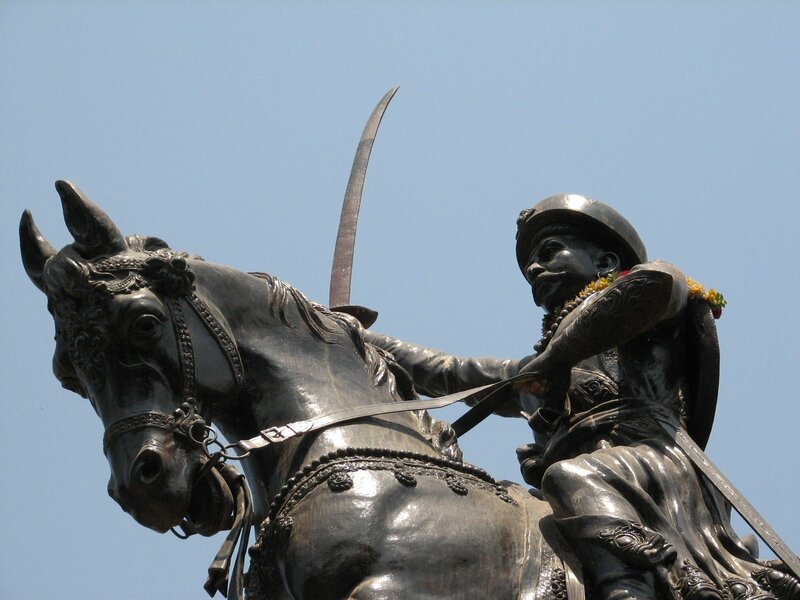 Meaning [As I have understood, If you have understood it differently please let me know]: Before this Marathas have won many battles, but none like this one. This cannot be captured in words and this victory is beyond description. Conquest of this place is a grace of God. 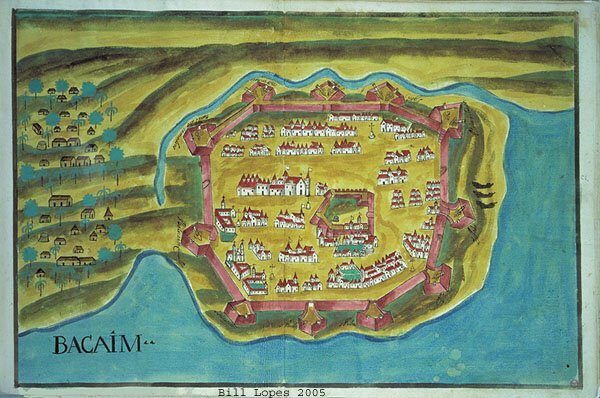 The survivors were given a safe passage out of the fort and 8 days to take away movable properties. 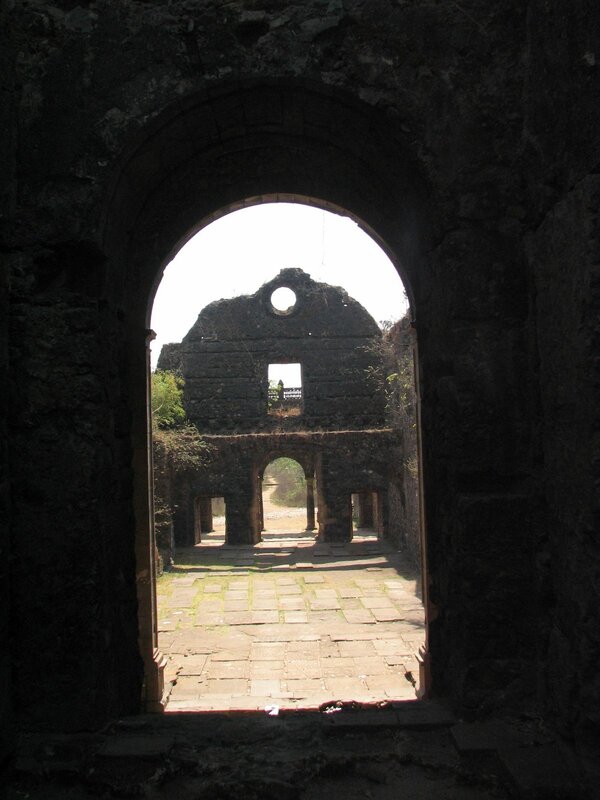 The fort and the buildings were ransacked and the bells in the churches were taken as mementos of victory. 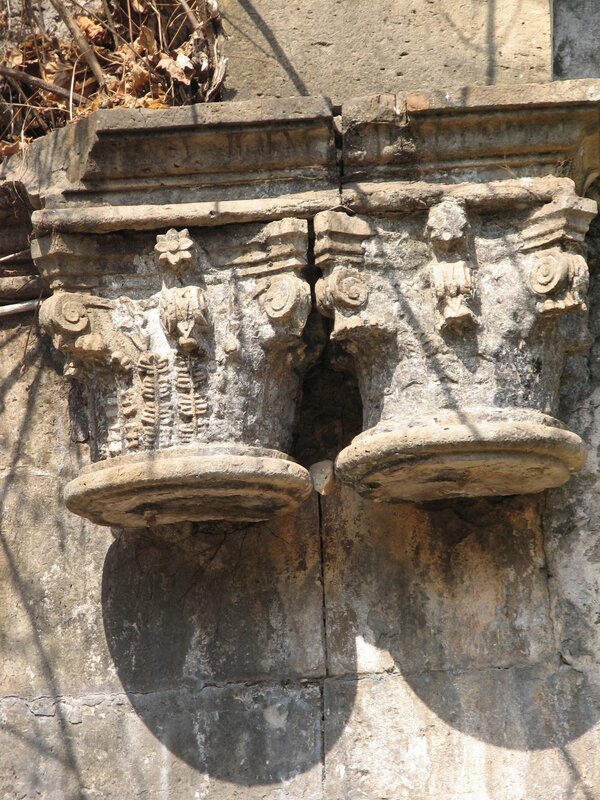 Two of the bells were installed at temples in Nashik and Sudhagad. You can see the pictures of the two here. We went to the Sebastian bastion which lies to the backside of the Chimaji Appa statue. There again a magnificent baobab specimen is present. 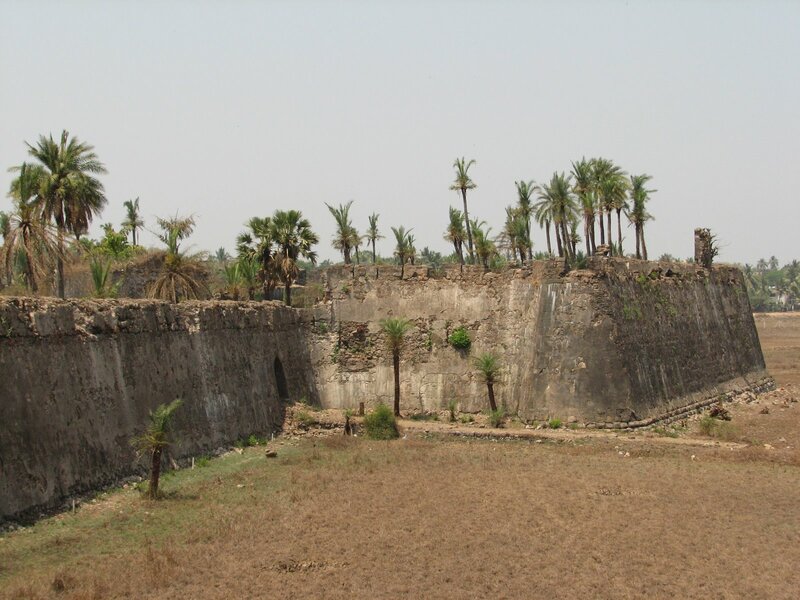 The Sebastian bastion, from where Marathas gained entry. The view of the bastions from the ground level, as they would have appeared to the attackers. There is a small entrance here, which leads you out in the marshlands ahead. I took some shots of the bastions as they are seen from the ground level. This was the end of our journey, we took an auto back to Vasai road station. But this is one place I would surely like to visit in the Monsoons. 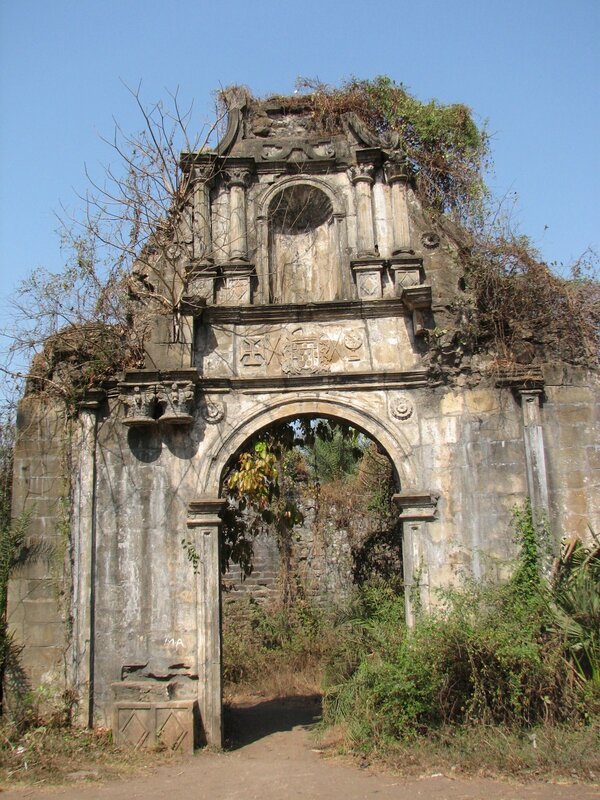 This entry was posted in arnala, baobab, bassien, battle, chimaji appa, fort, marathas, mumbai, portuguese, ruins, vasai. Bookmark the permalink.